Built on the ruins of a pagan temple before, and a Romanesque church after, it is dedicated to Maria Vergine Assunta in Cielo. It was built during the height of the architectural school of Fossanova and contains a large quantity of precious pieces. 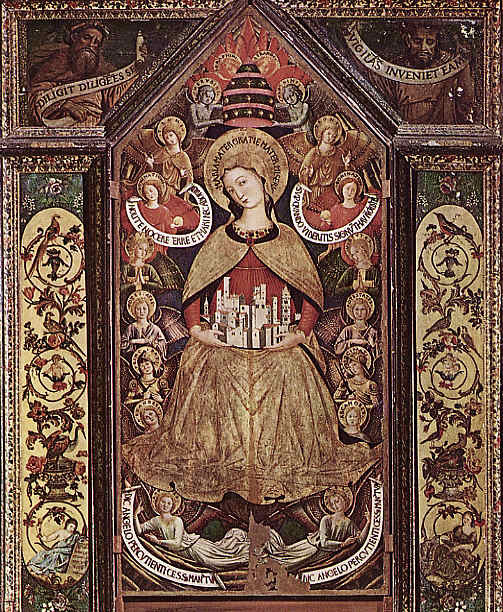 The most important is the beautiful board painted by Benozzo Gozzoli with the Madonna holding Sermoneta on her lap. At the base of the two holy water stoups are two lions belonging to the pagan temple and a sculptured episcopal throne probably shaped from an altar dedicated to the goddess Cibele. At the centre of the nave over an altar dating back to the year 1200, is a canopy under which lies a crucifix made by an artist of Sermoneta Giuseppe Beccari in the 18th century. Various gravestones bear witness to papal visits and burials of illustrous men. 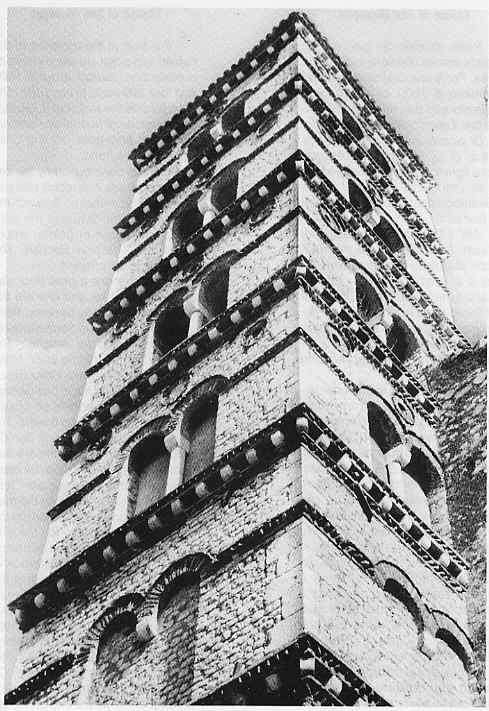 On the outside the beautiful Romanesque belfry with its five orders of mullioned windows, dominates the limestone houses of Sermoneta. It is built at the entrance of the hamlet with a flight of stone steps. Its construction started around 1500 and took 200 years to complete. The church hosts the statue of S. Giuseppe Protettore: of normal size and covered with pure gold, holding Child Gesus by the hand. In 1733 with contribution by the citizens, the facade was rebuilt with plaster on a stonebase. Around the main altar is the statue of the saint with Child Gesus in golden wood, made by Giuseppe Beccari. The church has six chapels. Consecrated in 1120 by the bishop Gregorio, it rises on a very ancient temple dedicated to the goddess Maia. The structures of this church show certain analogies to the church of S. Maria of Sermoneta. The plant is very particular and has a number of irregularities. It is divided into three aisles, with the lateral one turned to the north almost triangular in shape. The central aisle has an arcade that clearly derives from the one of S. Maria of Sermoneta. Very interesting is the small hall that can be approached by 20 small steps starting from the bottom of the lateral aisle on the left and ending with an ample door. Proceeding in a small vestibule before the aisle, on the vault are what remains of frescoes of Christ and two angels of the XI century in Byzantine style. The function of such a place in Christian times is unknown, nor does it help that next to it are the rests of a "coemeterium" which extends to the belfry. Coming out of the habitat and going up along olive trees one encounters the small chapels of the Via Crucis that bring us right to the Convent of S. Francesco. It opens on a large square that is also the entrance to the cemetery behind the big building. In the convent is an ancient cloister with a central well. Around the cloister are painted episodes of the life of S. Francesco by Angelo Guerra da Anagni around 1600. The church not only contains a nice altar and a wooden choir, but also a crucifix admirably sculptured in wood by one of the Minor friars. In the lateral chapel is erected the Temple of the Fallen in the Peloponneso, where the image of the Madonna del Fileremo di Rodi is venerated.